This guide to The Slides at Whiteface is intended to share information and stoke about some of the best sidecountry in the east. It is not intended as a recommendation for any person or group to ski the Slides. 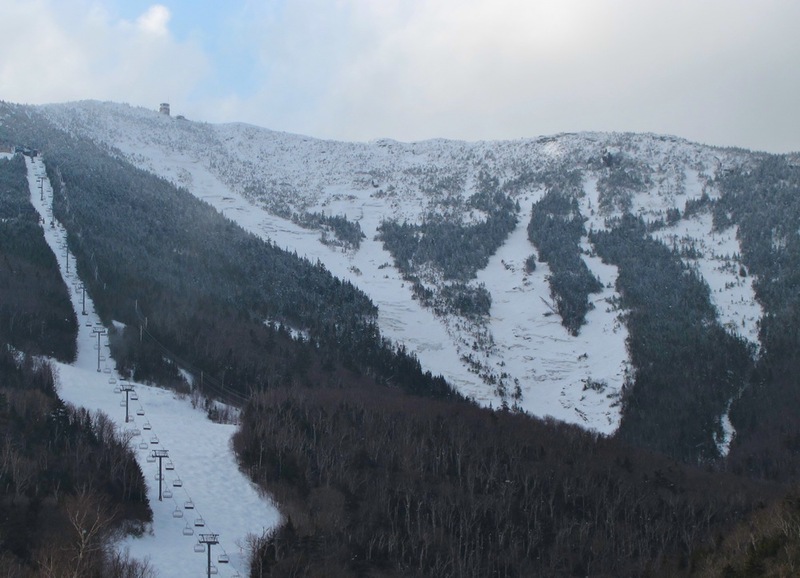 The Whiteface Slides offer some of the most unique lift-accessed skiing in the East. The Slides are a series of steep, narrow chutes through a largely unmaintained portion of the mountain that send skiers over frozen waterfalls, off rock ledges and through powder-filled tree lined gullies. The Slides are 35 acres of in-bounds, off-piste, double black-diamond skiing accessible with a short but strenuous hike from the top of the Summit Quad. They provide a challenging experience for expert skiers and riders once Whiteface determines the natural snow cover is adequate and stable. When the Slides are OPEN, the snow is often excellent. This is because patrol closely monitors the terrain and snowpack and only drops the rope when the conditions are prime. That doesn’t change the fact that the Slides are very steep, in places extremely tight, and often have spots of thin or non-existent cover. Those who haven’t skied the Slides often ask questions to determine if they are up to the challenge. If you have trouble confidently skiing tight trails like Empire or tree shots like Cloudsplitter Glades, the Slides may not be for you. Conditions range from perfect powder to sections of frozen waterfall. Some line choices can end with ledge drops. Every year Mother Nature dictates a different setup. Throughout the season sections such as the Slide 1 ice flows vary considerably. In addition, the Slides are a work in progress. Over the last few years, big rain events have created dramatic changes in the cirque. The Slides may be the most western-like terrain you will find inbounds in an eastern ski area, with one important difference. A cirque out west is likely to get much more than the 200+ annual inches of snow that fall on Whiteface. Higher snow totals would bury features that skiers have to deal with in the Slides. Because of this, you’ll need to ski a much shorter and tighter line than on similar western terrain. Before you decide to ski the Slides make sure your short-radius turn technique is up to the task. The Slides don’t open until mid-morning, so we recommend warming up by skiing the edges of Skyward to get used to the pitch. Stay within a half of a cat groomer track along the woods on the right or left side. Then move to Upper Cloudspin to get dialed in on ungroomed conditions. It’s helpful to practice hop and retraction turns in very tight spots. Keep your upper body pointed down the hill and don’t let your hands drop behind you as you turn. You may want to consider taking a lesson with a PSIA Level 3 Certified Instructor to get your game ready for the Slides. The NYSkiBlog Slide Guide is the work of ScottyJack, Coach Z, Highpeaksdrifter, and NYSkiBlog.